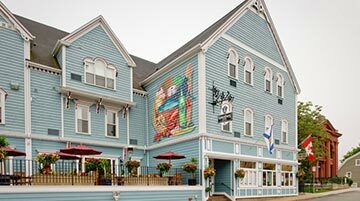 Get set for oceans of fun in Nova Scotia. 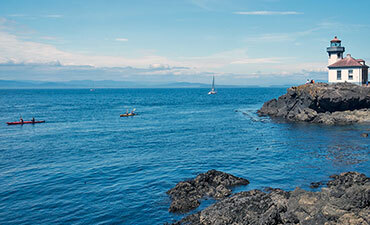 Bike past lighthouses, coastal farms and charming fishing villages. 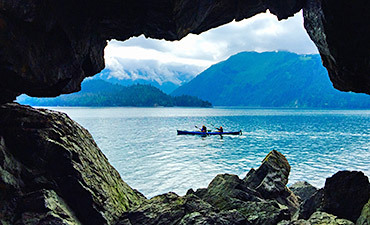 Hike along the beautiful shoreline and paddle kayaks among a maze of islands. 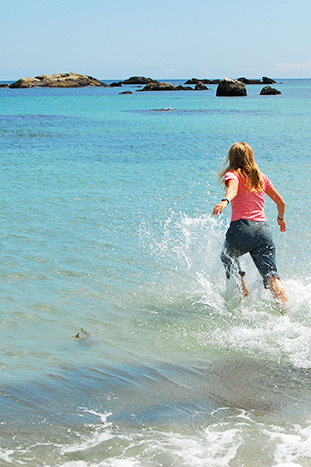 Whale watching and beach frolicking. 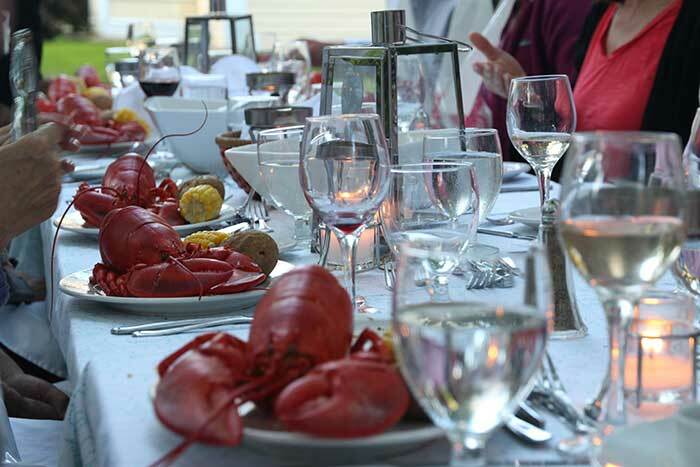 Delicious lobster dinners. Action-packed days you'll wish would never end! 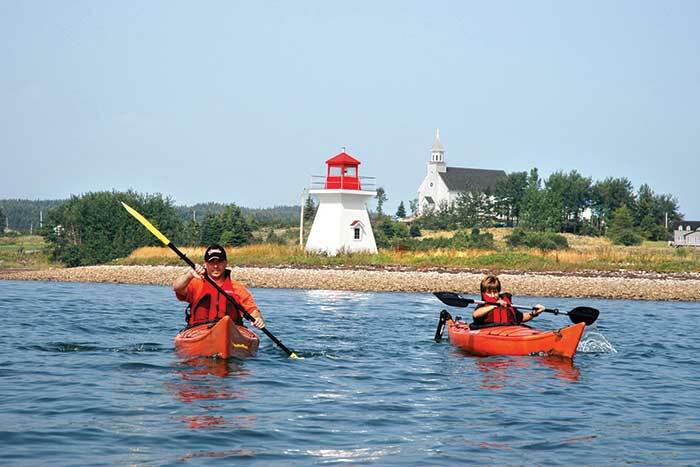 Day 1 Spin along Nova Scotia's famed South Shore to Port Medway Lighthouse (the first of many lighthouses throughout your trip) then hop off your bike for a closer look and to learn about the area's rich maritime history | Quiet roads lead through Beach Meadows all the way to the family-friendly White Point Resort set within the UNESCO Southwest Nova Biosphere Reserve | Kick off the week with a bonfire. Day 2 Amble in Kejimkujik Seaside Adjunct through coastal tundra forests and wooded groves | Pass secluded coves and salt lagoons, and walk on a magnificent white-sand beach | At Harbour Rocks, scan the cobblestone beaches for stones | Maybe even spot harbor seals catching rays | Kids don wetsuits for a surfing lesson in the Atlantic. 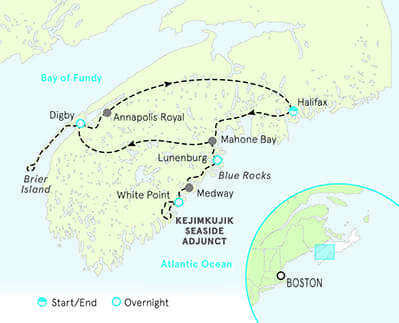 Days 3-4 Pedal to the LaHave Islands and take a cable ferry across the river | Pop into LaHave Bakery, a tasty stop along the way | Ride past fishing villages and inlets to Hirtle's Beach | Continue biking to the vibrant waterfront town of Lunenburg, a World Heritage site | Explore the rocky coast by kayak, paddling among the tiny islands of Blue Rocks. 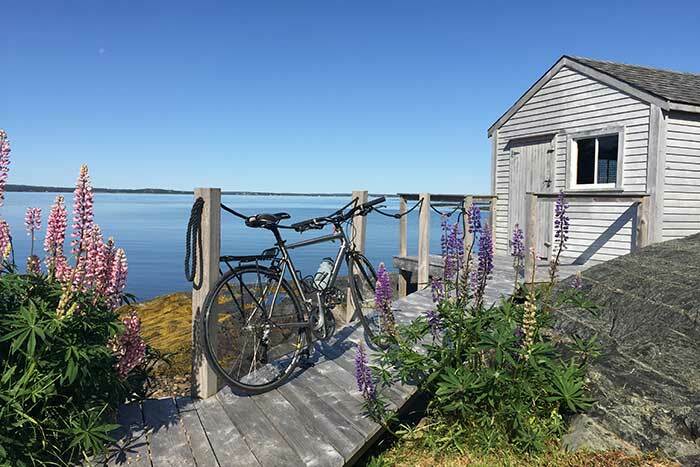 Days 5-6 Journey to Brier Island, the westernmost tip of Nova Scotia, for a walk on unspoiled coastal trails | Greet goats, sheep and alpacas at a family-run farm | Thar she blows! 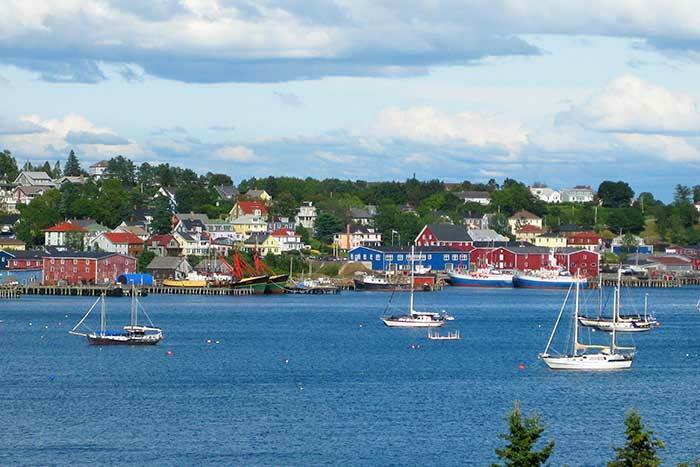 Look out for whales in the Bay of Fundy, known for having the world's highest tides | Dig into a lobster boil dinner | Conclude the trip with a farewell picnic in Annapolis Royal—birthplace of Canada! Note: The terrain on this trip features long moderate climbs with occasional steep hills. 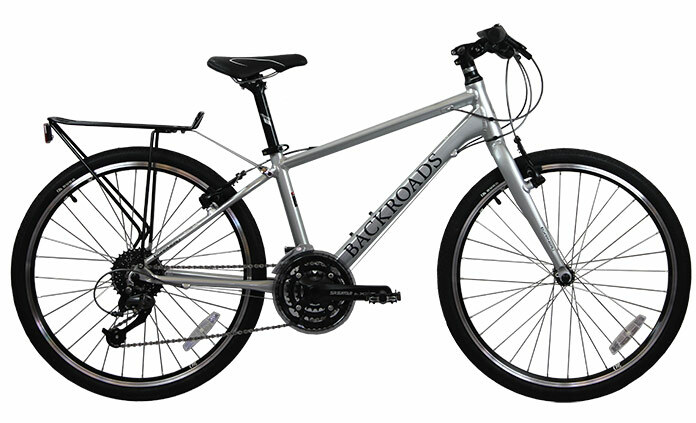 The roads are generally rough and gravelly with narrow shoulders, and there is one short section on hard-packed dirt. Windy conditions along some of our routes can also be a challenge. Kids' options are designed to avoid the busiest routes. 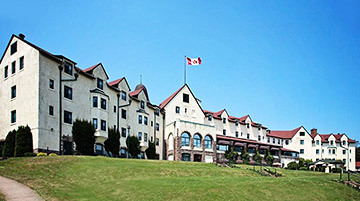 Nova Scotia is a land of rich heritage and rustic charm, and while Backroads has selected the best properties in the places we visit, history and character outweigh elegance and luxury in this Maritime province. 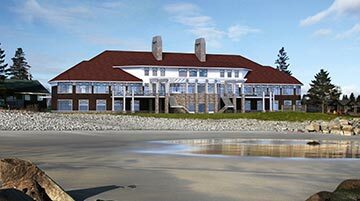 While our hotels offer simpler amenities than the typical Backroads property, they provide us with the greatest access to the best family activities in the region. Coordinating multiple activities throughout a single day can be tricky, but with Backroads you'll never know it. 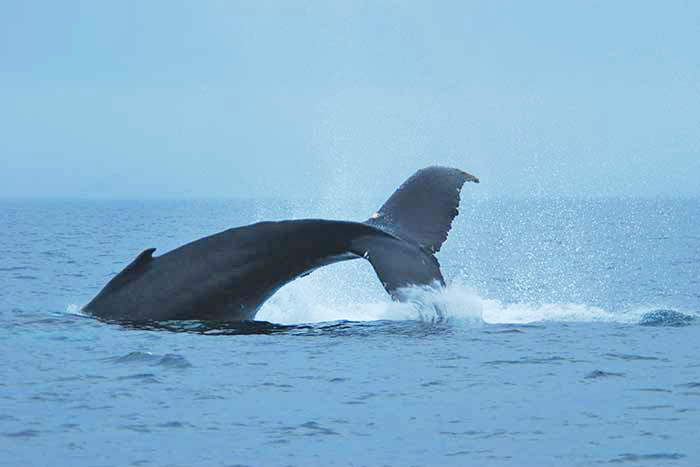 When you explore Nova Scotia with us, you switch activities seamlessly without missing a beat. We invented the multi-adventure concept, and we're constantly adding new dimensions and fine-tuning the experience to make it even more enjoyable. When everyone's together, there's lots going on; and when kids' and adults' priorities diverge, it can seem like two different trips. 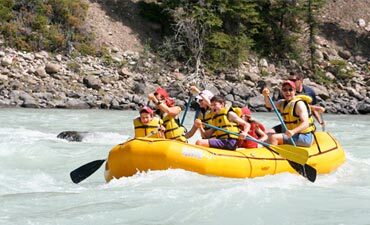 That's why our Family Adventures in Nova Scotia have three Trip Leaders—including a dedicated Kids Activity Expert who regularly takes younger travelers off to do their own thing. Other companies try to get by with two leaders; we step up and do it right. For more on our family focus, check this out.